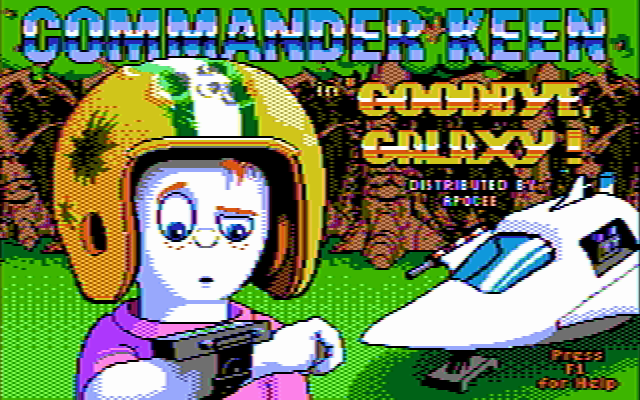 If you're just landing here at random and wondering about the title: this is a 16-color 'remaster' of the original CGA version of Commander Keen IV: Secret of the Oracle, with code patched and graphics redrawn and reworked to take optimal advantage of CGA's composite output capabilities. This patch started out as direct modification of the .EXE, following some disassembly and analysis. I "ported" it to the CKPATCH format (for in-memory patching) only when I was done, by generating a binary diff. This is why my notes will follow the disassembly, which is easier to comment on; all offsets are relative to the beginning of the load image (=file offset minus 2C00h) in v1.4-Apogee of the CGA executable. For new data, I found some 119 bytes that could be reused at offset 31548h. In KEEN4C.EXE this has the color tables for the EGA fade routines - they're still present in the CGA executable for no discernible reason. I ended up using only 36 bytes here, for extending the color tables used by various CGA drawing routines. Finding space for new code was a bit trickier. I ended up settling on 11FDDh, which contained a seemingly-unused function (a pointer to it is set during initialization, but then quickly set to something else before it ever gets called... at least as far as I could determine). No idea what this code was supposed to do -- might be a leftover from the Keen Dreams code, since it looks similar to some routine used to cache KDR level data; if you know what's going on there, I'm all ears. Whatever it is, it gives us a very generous 367 bytes to stomp over, plenty more than the 96 I eventually needed. Then there's graphics mode, which is set at 1AED9h. Keen uses mode 4 (320x200 @ 2bpp) with that infamous eyesore palette of cyan/magenta/white. We could still get 16 colors out of that on composite -- in fact that's what happens with the original game, although this is obviously not by design. I chose mode 6 however (640x200 @ 1bpp), mostly for cosmetic reasons: its palette of artifact colors is much more useful for Keen, plus it's more consistent between the 'old-style' and 'new-style' IBM CGA variants. 1AED9  9A8D13C510      call  newColorMode6  ; 10C5:138D - needs relocation! KEEN4E messes with EGA palette registers for its fade-in/out effects, but the CGA version just drops the fade schtick altogether. I suppose they could've used the darker version of the cyan/magenta/white palette, but that gives you just one intermediate step between full brightness and a black screen. What's nice about composite mode 6 is that it lets us go one better -- and without those bloated color tables that the EGA version needs, either. 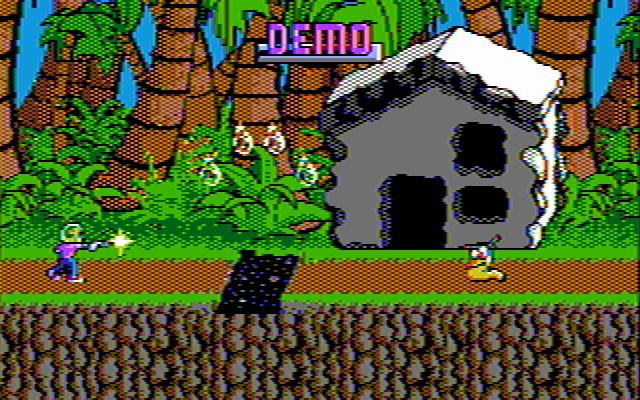 See, CGA lets us modify the foreground color in mode 6 (the default is F = intense white), unlike mode 4 where the same bits control the background color. In color composite mode this causes all 16 artifact colors to change accordingly (well, except black). For an EGA-like 4-step effect we can simply go "F, 7, 8, 0" to fade out, and the reverse to fade in. Ah, but how can we splice this code into the CGA version? In yet another stroke of luck, the fade functions are still present in the CGA .EXE, and called from all the right places -- they're just do-nothing stubs. Even more luckily, these stubs don't just return immediately: thanks to Borland C calling conventions, they monkey around with BP and SP first. That brings them up to 5 bytes, just enough for a far jump to new code (not a far call, since that would push a return pointer onto the stack, and we have no room for an extra retf to deal with that). 1AF67  EAAF13C510      jmp   newFadeOut     ; 10C5:13AF - needs relocation! 1AF6C  EA9913C510      jmp   newFadeIn      ; 10C5:1399 - needs relocation! 12022  9A290BC51B      call  VW_WaitVBL     ; 1BC5:0B29 - needs relocation! The important variable here is "screenfaded" (address 38CA1h), which is checked by the keystroke handling routine at 5CECh. The game shouldn't process keypresses while the screen is faded, or you may find yourself playing a level or navigating a menu on a completely black screen -- not terribly entertaining, I assure you. This proved to be a pain in the derriere until I had a look at what the EGA version was doing. You'll notice that I also set "fontcolor" (326B7h) to 1 after fading out, which is a bit of a nasty kludge to fix some unseemly text discolorations. There's probably a slicker solution to that, but we'll get to the text stuff in a bit. Besides sprites, tiles and pictures, the engine also draws single color elements onto the virtual screen segment (lines, rectangles and text), and does it often. In the CGA version, these functions all use 4-color lookup tables to do their business; to exploit our new-found 16-color composite palette, we're gonna need more than that. A byte is 4 pixels in low-res CGA-land, so on screen we get (in base-4) 0000, 1111, 2222, 3333 - solid black, solid cyan, solid magenta, solid white. In composite color modes however, each nybble represents a color, at half the resolution (this is not entirely accurate, but it's a useful visualization device). That would translate to 00 (black), 55 (grey), AA (grey) and FF (white). The two greys, by the way, have the exact same luminance. I only used 12 out of the new 16 colors there. There's enough room for the whole bunch, but I didn't need them all; and since I initially tried (and failed) to cram all the new *code* along with the data, space was at a premium. They're not in order either: the first 4 values duplicate the old tables, so whenever the color stays the same the index does too. I thought it'd be a nice touch if the in-game status panel (the big one you bring up with the Enter key) looked more like its EGA counterpart, which meant changing some field backgrounds from black to white. Problem was, the code sets AX to 0 (black) with "xor ax,ax" which is a two-byte instruction. White (3) -- or any other value -- would require "mov ax,color" which is a three-byter. To get this one sorted, I had to find more patch space by moving things around (previously I was shoving my new code into the data space as well). This allowed me to inject some code where I needed to explicitly set the font color. As a bonus, I could now do the same with the status panel and message boxes -- as-is they both use the same color for text, but since the backgrounds colors are different, the color value for XOR has to differ as well. ; 10C5:13F0 - needs relocation! ; 10C5:13E5 - needs relocation! ; 10C5:13D9 - needs relocation! As I recall, there were *still* occasional issues with the high score colors after I did that. I forget exactly what the major malfunction was, but at this point I decided to just bring a gun to the knife fight -- set fontcolor to 1 on every fade-out, so whatever text gets printed next will have that color, unless another routine explicitly sets it to something else. Dirty, but whatever works. The routine that displays all this XORs the font color with the background before drawing it, but this isn't strictly necessary; you can bake that into the values chosen above, and I ended up doing that and NOP-ing this instruction out... probably because that let me trim an entry or two off my color tables, or something. Kind of heavy-handed, but there you have it. And at long last, thus ends our wrangling with the .EXE. Well, there are a few other modifications like the initialization text and filename changes, but not much to say about those. Enough hacking for a couple weeks (and, I suspect, enough reading for a year). ...as you might expect, this is what took most of the effort. I won't launch into a technical tutorial about drawing for this mode, but there are a number of reasons why you can't just remap the palette of the EGA graphics and call it a day. For a start, you don't even have a constant horizontal resolution. Given that artifact colors are generated by manipulating pixel patterns, your effective resolution depends on the specific colors you're transitioning between at any particular point. The color of a pixel depends on its horizontal position (modulo 160, which is the number of NTSC color cycles per active CGA scanline). The palette itself has a rather different relationship between the colors, compared to those RGBI colors on EGA. It's lacking in nice pure reds, but gives you three perfectly good green hues; you get two identical-looking 50% greys, instead of that convenient 0-8-7-15 ramp; and so on so forth. The 'checkerboard' dithering style (which Keen uses extensively) would transform into solid horizontal lines of alternating colors... unless you make it twice as coarse. I could probably go on, but what this means is that practically all the graphics had to be reworked and redrawn. 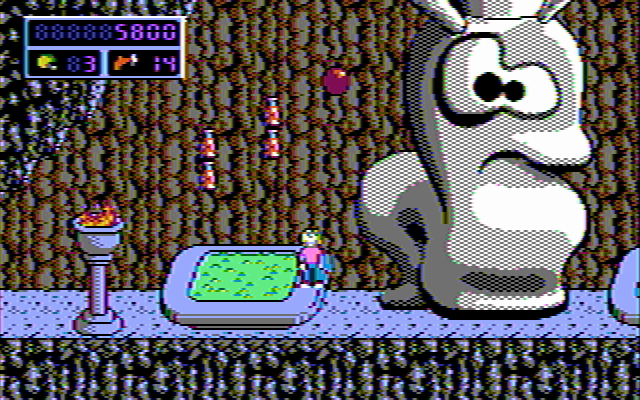 Most early games that supported composite color on CGA featured coarse, blocky, low-res graphics precisely for these reasons. One of my goals here was to avoid that, and preserve as much detail as I could; I hope I've succeeded, at least somewhat. On the left is what you see on composite; on the right is the RGBI pixel data under the hood - black and white patterns at 640x200. I typically work in Photoshop using RGB mode, with a palette that matches the 16 target colors, and a series of fill layers that go on top of the image and selectively blend each pattern over its matching color. This is similar to a trick mentioned in a previous post, with the bonus that I can always save a B&W RGBI picture like the one on the right, and feed it to reenigne's cga2ntsc for quick proofing. ModId needs 320x200 4-color images, though, which isn't what we're working with. Luckily, as far as the CGA is concerned, the memory layout is the same - except that each nybble represents two four-color dots instead of four two-color dots. We simply have to replace each pattern with the corresponding 4-color one; once the game displays it *in mode 6*, we get just the result we need. For instance, nybble pattern #9 (1001 in binary = white-black-black-white in mode 6) equals 21 in base 4, that is, magenta-cyan in mode 4. By replacing the aforementioned group of fill layers to generate these patterns instead, we get a fake mode-4 image that can be saved as an indexed .BMP and imported with ModId. I really think there should be a tandy mode version of Commander Keen. In fact, I was able to modify your patches to tandy mode 8, remap the colors, rework the fonts a bit and end up with a playable, albeit chunky 160x200 Keen 4 on my Tandy 1000. Tandy mode 8 and cga mode 4 have the same memory map, so the conversion is pretty straightforward. What would be really cool, is getting this to work in mode 9 (320x200). Digging through your patches, however, these don't seem to sync-up with the binary locations. Disassembling KEEN4C.EXE (using objdump) or running xxd, gives locations that don't agree with the locations in the patches. I'm assuming these are in-memory addresses, or something?? So I guess the question is, how did you end up with these locations? Yes, as stated, "all offsets are relative to the beginning of the load image (=file offset minus 2C00h)", so you can compute actual file offsets by adding 2C00h to the ones quoted here (addresses 0-21FFh in the .EXE contain the header and relocation table). That's how I had them in my notes, since IDA by default also calculates offsets relative to the load image rather the beginning of the file. A mode 9 patch would be awesome - certainly more than I was willing to try, since it'd still be programmed CGA-like, but basically use the EGA data (or some version of it shuffled around for speed). If that happens, I'd love to see the results! Ahh and you mention that offset right in the article. Reading comprehension fail. That points me in the right direction. Captured from Dosbox but looks reasonable similar on my tandy 1000 sl with IBM 5153. Dark grey is much darker on real hardware, so certain instances were replaced with light grey. Mostly I spent time reworking the smaller text (menus and such, starting with the original CGA RGB fonts) they were a completely unreadable mess otherwise. I may need to remap some colors here and there, but I have a simple python script that makes this quick and easy. As for mode 9, I could see going about this a couple ways. Modifying the CGA keen to display mode 9 displays a weird sort of interlaced screen, which makes perfect sense since sets of lines are in the wrong memory location, with many ending up blank. I suspect that hacking modid to correctly pack the graphics into the correct format may be a big part of the trick, but I'm just starting to look into it. I considered for a moment attempting to modify the EGA version to do tandy mode 9. I was able to disable the hardware checking and such, but of course this didn't work. EGA (from my cursory knowledge) is different enough at the BIOS level that there are certainly things being done here that have no way to map. I start to wonder about the so-called "CKSRCMOD" code - is it able to drive CK4? If so, perhaps that code could be used to create a Tandy 320x200x16 version.